I could really use some help trying to calculate the gain of a triode tube stage. I saw a couple of formulas but non of them really worked for me. So when there is a schematic of a tube stage with all that resistance values given. What is the universal formula to calculate the gain? In the datasheet of the 12AX7 there is also a small table where the gain is given for some concrete values but I have no idea how they got there. The basic way to understand the triode gain stage is that gain (A) = -u RA / Ra + ra assuming cathode is fully bypassed, as your example is by the 10u cap. The "unknowns" - u and ra - can be determined from the load line for best accuracy, but data sheets also give some 'generic values', which we'll use here. The plate resistor (NOT ra, the actual resistor) here is 100k. So, - 100 * 100k / 100k + 70k results in a gain of about -58. "Minus" simply meaning the stage inverts the signal. If the cathode resistor is not fully bypassed, the gain will be lower and you have to account for the cathode resistor; the formula just changes to include Rk. This comes from HERE: http://www.valvewizard.co.uk/gainstage.html And you can find the other forumula with Rk, and read WHY, there. You need to 'get' gm, the load line, and where "mu" comes from, to get closer than the approximations...however, the approx. is usually JUST FINE! Great! Big thanks for that explanation! The ra value of 62500 to 80000R really confused me. So is Rk only there to set the neg grid voltage? And is the gain equal if reducing Ua, as long it is in the linear part of the tube? But there's still another thing I don't get. The table in my second pictures shows the gain for some values, but if I use your formula all the numbers for gain would be the same with the same Rp(Ra). So it seems that Ua and Rk don't matter at all for the value of total gain. Or is it the thing you meant with approximate? Yes. If it is bypassed with a big cap, it has no effect on the gain. Mostly yes. Ua has a small effect on the gain, since higher voltage lead to higher anode current which means slightly higher gm (lower ra), and therefore a bit more gain. So it seems that Ua and Rk don't matter at all for the value of total gain. Or is it the thing you meant with approximate? Ua does have a small effect, as shown by the table, but to a first approximation we ignore it. "ra" is the plate's AC resistance, which is a property of the tube's construction (it is going to be pretty consistent with ALL of one model tube, tho, such as a 12AX7). The 'plate resistor', RA, is DC resistance, which WE set. You can get by with the data sheet "ra"; it will be close enough for most work. But if you want to be able to calculate the ACTUAL ra of your circuit, you first must learn how to use "load lines", which are set up using some fundamental data you obtain from the tube data sheet. I learned how to do this by getting Merlin's book on Tube Preamp Design, which I HIGHLY recommend as a great 1-stop source for answering these questions; there are FEW if any practical 'how to design tube stuff' books out there.... If you read the PDF I linked to, it has some good info about what I am talking about, particularly around Page 6. Put simply, "ra" varies according to how you have set the tube up to run, using the load lines previously mentioned. This includes how the heater is operated. Keep studying these things, asking questions, and it won't remain a mystery for too long - you're halfway there already In the end, you DO want to know how to make these calculations...but in reality you may 'approximate' as we keep saying, or even MEASURE voltages in/out to FIND OUT what the gain is! And MANY topologies repeat, so you will learn 'to estimate roughly'. You'll understand as you go along. > ...gain of a triode tube stage. I saw a couple of formulas but non of them really worked for me. "Doesn't work" is not enough information. Show your work. Do not be embarrassed. We ALL make simple mistakes in non-simple problems. You should know this one by heart. It is used everywhere. Gain is "50 for all practical purpose". > table where the gain is given for some concrete values but I have no idea how they got there. I was searching for some calculator everywhere. But what is RL? The load of the pickups, the resistance of the next stage or else? There's one thing with the neg grid voltage I don't get. When the 100mV from the pickups is amplified by 50, the voltage going into the next stage is +-5V. So doesn't that set the grid voltage that is set to for example -1 above 0 volts? Or does the voltage at the anode automatically change so the grid always sees -1V? 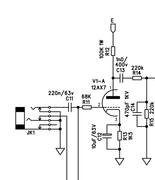 In the schematic of the TH-30 the Ra resistor of the next staged is bypassed with a cap. What does that do? > When the 100mV from the pickups is amplified by 50, the voltage going into the next stage is +-5V. Then that next stage *distorts*. Look at the Classics (not modern hot-rods). There is usually a Volume control after the first stage. The User (who me?) turns that for desired result. Down for Clean. Up for distortion. Even the TH30 does that. One model of Traynor BassMate didn't, and it was rather fussy to play clean. > Ra resistor of the next staged is bypassed with a cap. What does that do? What is a cap? A Pseudo-resistor which is infinity for low frequency and short for high frequency. The stage gain is related to load resistance/impedance. So low freq is full gain, high freq is zero gain, with a slope between lows and highs. However, 0.1"m" against the ~~40K of 12AX7||100K seems awful large. I can confirm that, it's the YBA-2a/b, I used to have one that I bought from the bassist of White Witch. Sold it to my old roommate as a concession to my wife in hopes that he'd never play it and sell it back to me, but I made the mistake of knowing his guitar tone really well and tweaked it just how he likes to sound and I'll never own it again. As much as I love my Fenders, I'm also a pretty big fan of the gain stage-volume-gain stage-tone stack arrangement you find in quite a few amps like traynors and hiwatts. To add to the confusion, but add another tool to the discussion of fine tuning gain stages... you can try the Local Negative Feedback you find in Dumbles and HiFi equipment. I'm getting ready to build a dumble-ish amp for a guy and decided to play around with some of the stuff in my super just to explore and really dig it. I'm a fan of mixing the normal and reverb channels at the extra gain stage of the reverb channel so they are in phase and you can jump the channels, but this reduces headroom, local negative feedback tuned everything right up to where I wanted it to be. New and exciting innovations in current technology! Bone is in the fingers. Generally speaking, RL is the load placed on *something*, in this case of course your triode gain stage. That could be a resistive voltage divider network, but most often is just taken to be the next stage's grid resistance, which is extremely high. You will often see a grid leak resistor at the grid (WOW! ), of 1M. So we will take that as RL. Sometimes they use a lower value grid leak to load the previous stage a little, for some tone-tweaking...maybe 470k. So you'd use that. RL isn't usually a HUGE issue, but it helps to be able to express the load your stage is driving. You see this with tone controls, eq, tone stacks, a lot. Differing RL can shift your frequency response in some noticeable ways. For nostalgia, I simmed the 6BQ5 BassMate preamp. Two cold-biased stages with no pad nor volume/tone between. Total gain is 150 (so 12 per stage). Input overload is some above 200mV peak, perhaps 200mV RMS (compared to 500-1000mV for many classic Fenders). Notably it goes very second-harmonic past there. I had a small microphone which did this, and when overdriven in the bell of a sax, it was not "right" but OTOH it could be used by the player. I suspect it had a similar function if used for bass with that too-small box: it could throw 2nd harmonics up into the speaker's working range for "implied bass". Yes, I didn't want to go too far into impedance and differing gain at different frequencies, if we're starting with "what's RL".... Merlin's book is EXCELLENT at taking one thru this and worth every penny, IMO. Capacitance certainly is a major player. It's good to understand what is happening (I would actually say 'vital'), and then you go out and start putting them together, where it becomes trial and error, starting from some 'always done' designs.